The original house dates from the early 17th century. The orangery was added in about 1700. In 1754 it was bought by William Murray, 1st Earl of Mansfield. He commissioned Robert Adam to remodel it from 1764-1779. Adam added the library (one of his most famous interiors) to balance the orangery, and added the Ionic portico at the entrance. 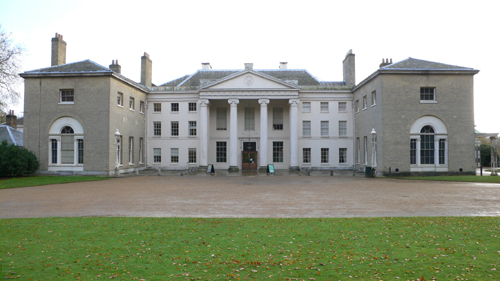 Brewing magnate Edward Cecil Guinness, first Earl of Iveagh, bought Kenwood House and estate in 1925. When he died in 1927, he bequeathed the house,estate and part of his collection of pictures to the nation. The Iveagh Bequest includes important paintings by many great artists, including Rembrandt, Vermeer, Turner, Reynolds and Gainsborough. (A slightly oblique connection, but I have also worked on the late Lady Iveagh’s house in Wiltshire – Wilbury). I provided advice and Papers and Paints provided the “Invisible Green” paint for the extensive fencing around the house. * James Crease. Hints for the Preservation of Wood Work Exposed to the Weather. Applicable to all kinds of Fences, Gates, Bridges, Ships, &c. In a letter to Dr. Parry, of Bath. By James Crease, Inventor of Cheap Paint. 1808.